OK, poor start to the series. I labelled the first post “Part I”, but van Til labels it a mere introduction. Hence, “Part II” is actually chapter 1… go figure. I think what has struck me is that to be involved in apologetics, you need to know what you are defending. And as van Til points out, we are defending “Christian-theism as a unit”. What this means is that if you are doing walk-up, you must speak of the Christian God, and not god in general. To an atheist, you must speak to him of the Christian God. van Til’s point is that you can’t defend Christianity (the historical religion) apart from Christian theism (which involves philosophical discussion). This Christian theism is known as “doctrine”. And van Til argues that to speak of doctrine, you must speak in the language of philosophy. Yet this language is not divorced from the Bible (it is not an appeal to reason or experience), but is deeply grounded in it. Therefore, this system of truth, this Christian theism, this doctrine is what Christianity is founded upon, and it is this that we present, and it is this that we defend. This feels esoteric at the moment. But, think about when you do walk-up. What questions do you ask, and what points do you defend? What words, or concepts, or worldviews do you present. If you are talking to an atheist, you cannot use theistic arguments to first convince them of the existence of God, then move to the reformed view of salvation. No, your first and only argument is the reformed view of the existence of God, and the the reformed view of salvation: our first and only apologetic must be the reformed Christian apologetic, which van Til points out is in opposition to Romanist and Arminian apologetics. This I still feel somewhat uneasy with, if only for the labels. To defend a reformed or evangelical doctrine (which I do in practice) is fine, but to label it that means that I am automatically emphasising a division in Christianity. That division does truly exist (doesn’t mean I have to like it though). Second, I think we need to be conscious about our reformed evangelical faith. We are not merely Christian, but Reformed Evangelical Christians, bound to the Scriptures, but influenced by those who have gone before us like Luther, like Calvin, and like van Til. And so as we do our evangelism, our teaching, our encouraging and growing, we hold must hold that we are doing this in the Reformed Tradition. Sure, “tradition” is a pejorative word that the reformers held against the Romanists, yet it is what we hold to be true. So I thought it time that I blog something productive. 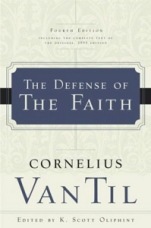 I’m currently reading The Defense of the Faith by Cornelius van Til. This series will hopefully become a summary and reflection on the ideas that are raised by van Til. The first thing to note is that this book is a polemic. As the title suggests, it is a defensive response by van Til to critics of his work. However, it was both eye-opening and interesting to read that what van Til is defending is the “reformed” faith, and not the faith in general. So often in today’s apologetics, and evangelism, we think of bringing people to faith in Christ, but usually in general “Christianity” terms. When we chat about Christ, we may speak in reformed terms, but rarely are we conscious of it. I have never considered myself as “reformed” (by this, I mean that I am never consciously thinking of myself by that label, though I am wholeheartedly reformed in my theology), but van Til’s book raises the point that the reformed faith is what we should stand up for. For example, when we evangelise, we evangelise people into the reformed faith, and not some other form of the Christian faith. How often are we conscious of this? Second idea in the first chapter is that van Til is very conscious of using secular philosophical terms and redefining them. We’ll discuss this further next time, but I was interested to see that most of the criticism that was levelled against van Til was because he describes himself as doing reformed faith apologetics, or for using secular philosophical terms with Christian meanings. It is with these two themes in mind that van Til writes. Part II discusses the “reformed” theology, and how this forms the basis for apologetics.